Lee Ha-eung (1820 – 1898), served as the regent, Daewongun, or formally Heungseon Heonui Daewonwang, during much of the later nineteenth century. Daewon-gun, the father of the penultimate Joseon monarch, Gojong, decisively wielded royal power for ten years before Gojong reached adulthood. Daewongun's rule came at the end of the Joseon and, for better or worse, he played a gigantic role in that drama. Daewon-gun literally translates as "prince of the great court," a title customarily granted to the father of the reigning monarch when that father did not reign himself. While there have been three other Daewon-gun in Joseon Dynasty, so dominant a role did Yi Ha-eung play in the last years of the Joseon dynasty that the term Daewongun usually refers specifically to him. Yi Ha-eung, best known by his title as regent to King Gojong, Daewongun, was an obscure descendant of Yeongjo, the 21st Joseon King. When it became clear that King Cheoljong, the 25th king, was likely to die without an heir, Daewongun approached the Dowager Queen Sinjeong, recommending his son Yi Myeongbok as the next king. Myeongbok was only 12 years old at the time, and the Dowager agreed with Daewongun's strategy of choosing Myeongbok over his elder brother, because it meant a longer period of regency. 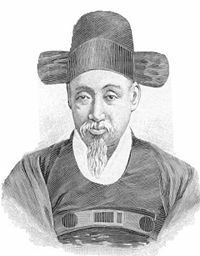 Yi Myeongbok was crowned King Gojong of Joseon in 1864, and Daewongun stood as the main administrator of the nation, with Dowager Queen Sinjeong in the position of regent. Following in the footsteps of his royal ancestor, King Yeongjo of Joseon (r. 1724-1776), Daewongun instituted measures to once again correct the system of recruiting government officials according to merit and ability, in addition to many other noteworthy reform measures. One of the most sweeping was the elimination of all but a handful of the thousands of Sowons located throughout the nation. The Sowons were Confucianist academies which had become breeding grounds for rival political factions, many of which operated large farming enterprises with slave labor, in abuse of the tax-exempt status they had been granted centuries earlier as institutes of learning. At the request of Dowager Queen Sinjeong, Daewongun also gave orders for the restoration of Gyeongbok Palace, originally built at the beginning of the Joseon era, in 1395. A huge undertaking, requiring an immense budget and a large workforce, work began in 1865. Seven years later, King Gojong and the royal family took up residence in the palace, and many major milestones in the final years of the Joseon Dynasty took place there. Daewongun aimed, fundamentally, to run Korea according to traditional Joseon principles, such as the three systems of land tax, grain relief, and military service. Getting those systems back in proper operation proved a tall order, because the situation in Joseon had disintegrated substantially since the reforms and improvements made during the reigns of Yeongjo and his grandson, Chongjo (r. 1776-1800). Daewongun's interpretation of the proper way to apply the principles also proved problematic in a few areas, which ultimately proved his undoing, and at the same time had seriously detrimental consequences for the country. Although, in principle, removing the imbalance of treatment in taxation, military service, and other areas that had given the yangban an unfairly privileged position, should have produced a better society, Daewongun failed to calculate how strongly and in what way the affected yangban would respond. Within a few years, he had gained a considerable number of political enemies, over whom he could not ultimately prevail. Daewongun also failed to recognize that the march of time demanded that Joseon cultivate relations with outside powers to survive in the new world order. He tried to keep Joseon pure, free from outside influences. To that end, he authorized the massacre of many Catholic missionaries and converts. While his economic reforms had made him enemies at home, his attacks on the Catholics came to the attention of the French, who already had a substantial military presence in Indochina. A squadron of French Navy vessels moved against the Joseon island of Ganghwado on October 13, 1866. Although the Joseon army was able to drive them away, the door to continued unavoidable contact with outside western and Asian powers was opened, and remained open from then on. A few years after Gojong took the throne, Daewongun decided it was time for the young king to marry. The Dowager Queen Sincheong and Daewongun considered many candidates for the royal bride. Finally, they chose a young lady from the Min family, the same clan as Daewongun's own wife. The daughter of Min Chi-rok, Min Jayoung seemed a safe choice—well educated, of sufficiently noble birth, and, having been orphaned at the age of eight, she did not have parents whose political ambitions would have to be taken into account. After the requisite checks and courtship ceremonies, the young King Gojong and Min Jayoung married in March of 1866, and she became Queen Min. As it turned out, the young Queen possessed a keen intelligence and proved a quick learner, interested in politics and gifted in networking. She gathered a circle of strong allies, and before long Queen Min had enough political clout to start working toward removing Daewongun as the keeper of the royal seal and elevating King Gojong to rule in his own right. Daewongun and Queen Min engaged in recurrent power struggles for a number of years. She had him sent into exile in 1882, but he returned four years later, briefly regaining power in 1895, with Japanese aid. Friction between King Gojong and Daewongun sparked from early on. As time went by, and Gojong's relationship with Queen Min grew closer and closer, his relationship with his father, Daewongun became more and more distant. A possibility exists that Gojong suspected his father of being involved with the Japanese-backed assassination of Queen Min in 1895. In any case, after her death, the relationship between the two men became even more strained, and never improved. After he retired as regent in 1873, he resumed his work as a calligrapher and painter. He gained renown for his paintings of orchids. He also took the reigns of the nation again briefly after a military coup, and was kidnapped and held in China for a few years. After his death in Seoul in 1898, his son, Emperor Gogong, interred him at Gongdukri, Goyanggun. Gojong moved his body to Daedukri, Pajugun, later the same year. In 1906, the royal court removed his body to the current location of his tomb in Moran Park, Chasanri, Namyangju City, northeast of Seoul. Emperor Gojong's son, Emperor Sunjong, felt that his grandfather had made a significant contribution to Joseon, and in 1908, posthumously raised Daewongun to the rank of Imperial Prince, with the title of Heungseon Heoneu Daewon-wang. Daewongun worked to put his young son on the throne in order that he himself would have the chance to run Joseon as Regent. Observation of his actions during his years of rule reveals an honest effort on his part to advance and improve the state of the nation. Earnestly dedicated to Confucian ethics, he embarked immediately on a campaign to remove the corruption that had crept in to the country during the decades prior to Gojong's ascension, appointing government officials on ability and merit, rather than family connections or personal favors. He also removed tax exempt status from the Sowons, educational institutions that had come to abuse the privilege. He set into motion the restoration of Kyeongbok Palace in an effort to return Joseon to its former glory. He worked in great earnest to maintain Joseon's integrity by isolating the country from unnecessary contact with outside elements. Unfortunately, as it turned out, toward the end of the nineteenth century isolation no longer served the best interests of the country. It was time to carefully and constructively build relationships with other powers. As this did not happen during Daewongun's rule, the task fell to Gojong, when he took over on reaching adulthood. Kim, Yongshik. 1971. Taewŏngun, the Catholic Movement, and the Role of Religion in Transitional Politics. Thesis—Brigham Young University. Yu, Chu-hyŏn. 1985. Taewŏn Kun. Sŏul T'ŭkpyŏlsi: Yangudang. All links retrieved November 18, 2017. What's On Korea: Unhyeongung, the Symbol of Korean Modern History. This page was last modified on 18 November 2017, at 22:50.